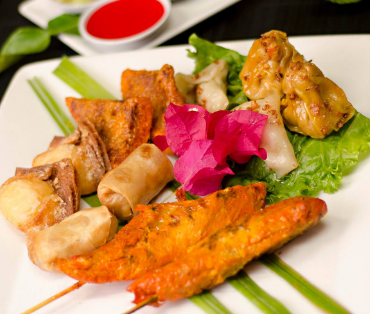 Two spring rolls, chicken satay, Thai toast, crab rangoons, siamese kisses & tofu spinach potstickers with six housemade sauces. Toast points filled with chicken, garlic & madras curry coated with egg batter, flash fried with spicy cucumber red onion sauce. 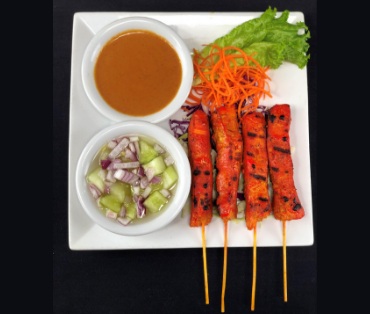 Four coconut milk marinated chicken skewers, gilled with yellow curry & Thai spices with peanut & cucumber red onion sauces. Fresh vegetables flash-fried in egg based tempura batter. Served with honey mustard soy sauce. Steamed‎ wontons filled with tofu & fresh spinach topped with crispy garlic & scallions with three sauces. 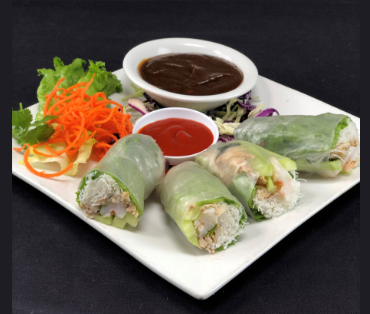 Two rice paper rolls with chicken, shrimp, rice noodles, mint, cucumber & cabbage. Also available with tofu. Succulent‎ shrimp hand pressed in coconut, flash-fried with spicy pineapple & sweet pickled jalapeno sauces. Tempura battered calamari rings, served with a side of sweet roasted chili reduction and spicy sriracha sauce. 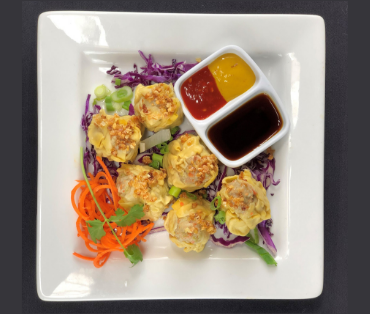 Crispy, golden wontons filled with fresh lump crab and cream cheese, paired with sweet raspberry sake sauce. Bite sized crispy catfish with a sweet roasted chili reduction sauce. Two flash-fried, ten oz whitefish filets glazed with a sweet pickled jalapeno garlic sauce & fresh cilantro on a bed of crisp cabbage. 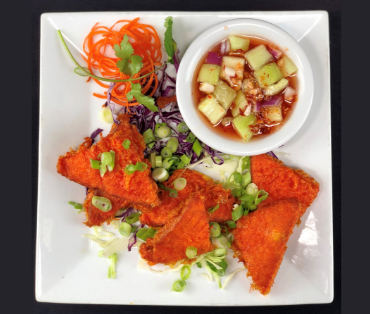 Battered,‎ flash-fried chicken breast pieces tossed with pineapple, tomato, mushroom & carrots in our sweet & sour garlic tamarind glaze. The staff favorite! 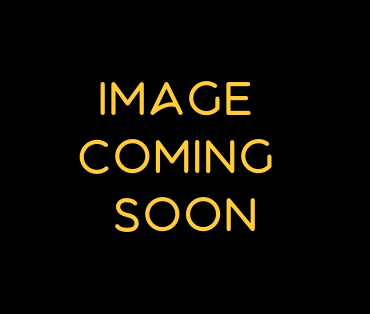 Crispy bite-sized chicken, tossed in a sweet tamarind chili reduction sauce, served over flash-fried basil. 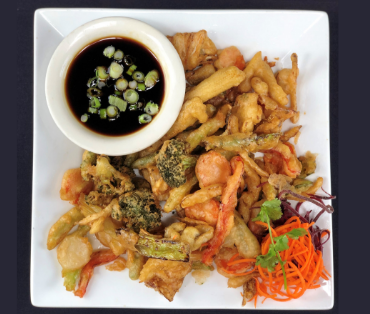 Crispy‎ chicken morsels, pineapple, mushroom and green onion sauteed in our teriyaki sauce. Marinated roasted half duck breast served hot over a bed of fresh spinach with a sweet ginger soy duck sauce. Fresh spinach, grilled chicken and curried peanut sauce, simply perfect. 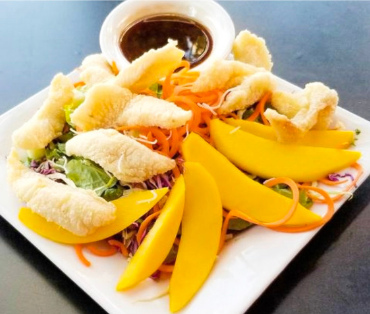 One crispy ten oz fish filet topped with ripe mango, onion, ginger, lemongrass, toasted coconut flakes & lime drizzled with a sweet tamarind sauce. Shrimp‎ & calamari sauteed with ground Thai chilis, garlic, krachai root & green pepppercorn with onion & Chinese broccoli. Madras curry sauteed with shrimp, scallops, basil, tender bok choy, carrots, snow peas, garlic & freshly ground Thai chilis. Decadent kefir lime curry with coconut cream over carrots and bell pepper. Potato, carrot, bell pepper & onion in a creamy coconut yellow curry. Rich, thick peanut curry served over steamed green beans. A spicy green curry with hints of basil & Thai chilis served with coconut cream, green beans & bamboo shoots. Mussamon curry with coconut milk, potato, carrot, sweet onion & whole peanuts. A chinese influenced stir fry with an array of vegetables in a mild garlic sauce. Bell pepper, carrots & onion in a garlic plum sauce topped with roasted cashew nuts. Carrots, onion, mushroom & celery with cashews in our unique homemade chili reduction sauce. Steamed‎ broccoli in a flavorful garlic oyster sauce. Japanese‎ eggplant sauteed in a preserved yellow bean & garlic sauce. Fried rice tossed with Thai basil, egg, bell peppers, jalapenos & Chinese broccoli. A Thai classic fried rice dish with pineapple, mushrooms, white onion & roasted cashews. Fried jasmine rice with egg & an assortment of fresh vegetables. Flat noodles, onion tomato & bean sprouts tossed with a garlic paprika vinaigrette. Rice noodles tossed with fresh Thai basil & bean sprouts in a light green curry sauce. Transparent‎ noodles tossed with egg & fresh vegetables in a light sauce. Flat rice noodles & broccoli tossed in sweet soy vinaigrette. Rice Noodles with egg, bean sprouts & green onions in a sweet vinaigrette paprika sauce with ground peanuts & a lime wedge – with chicken & shrimp. Egg‎ noodles & a vegetable medley in sesame garlic soy sauce – with chicken & shrimp. Spring mix topped with grilled, curried chicken and edamame. Served with a citrus peanut dressing. Shredded green papaya, green beans, tomatos & whole peanuts muddled with a fresh lime vinaigrette. Steamed scallops, shrimp, calamari & mussels tossed with green leaf lettuce, cilantro, tomato, onion, cucumber & carrot in a tangy garlic lime vinaigrette. A flavorful garlic broth served with handmade chicken dumplings, chicken, and green leaf lettuce. A house favorite! 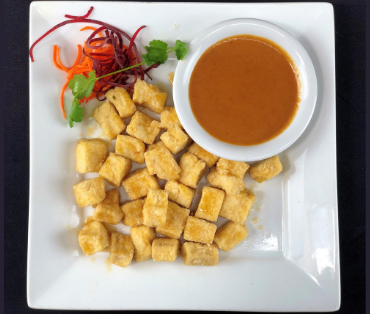 Our original chili reduction hot & sour soup served without the coconut milk. 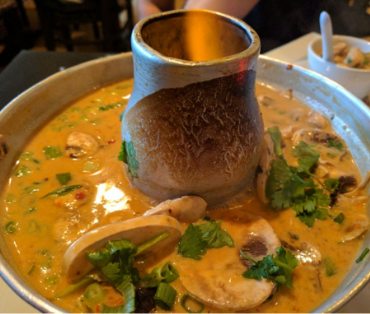 Malee’s famous coconut ginger soup with our original chili reduction sauce, mushrooms, fresh lemongrass, galanga root & kafir lime leaf with cilantro & green onion. 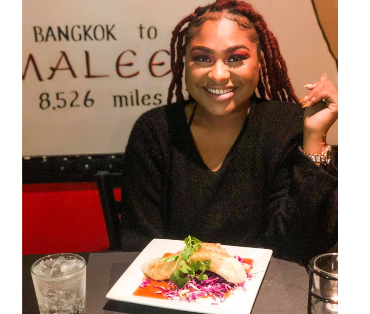 Bite sized fired catfish in a sweet robust chili reduction sauce. Flash-fried puffs w/ crab & cream cheese served w/ at tangy raspberry sauce. Rice paper roll stuffed w/ chicken, shrimp, rice noodles, mint, cucumber, & cabbage. Served cold. Rice paper rolls stuffed w/ tofu, rice noodles, mint, cucumber & cabbage. Served cold. W/ peanuts sauce & sweet miso. Shumai dumplings filled w/ minced chicken & shrimp topped w/ crispy garlic. A‎ 6 oz. portion topped w/ kosher salt. Stuffed with egg, carrot & bean vermicelli. Served w/ a sweet and sour sauce. Flash fried toast points filled w/ garlic & chicken. Served w/ a spicy cucumber sauce. Marinated‎ chicken tenderloin served w/ peanut & a cucumber sauce. Steamed wontons filled w/ sesame-seasoned steamed tofu & spinach. Topped w/ crispy garlic and served w/ a trio of sauces. Fresh vegetables flash-fried in an egg based tempura batter. Served w/ a honey mustard soy sauce. Spicy dishes are designated with an *. Choose a spice level of Medium, Hot, Very Hot and Thai Hot. Linguini noodles generously tossed in roasted sesame dressing, finished with carrots, bean sprouts & green onion. Your choice of smoked tofu or shredded white meat chicken. Shredded chicken breast, white & red cabbage, lettuce & red onion in a sesame ginger dressing, topped with crisped egg noodles. Steamed Chinese egg noodles topped with marinated, grilled chicken breast with freshly diced tomatoes, cucumber & red onion. 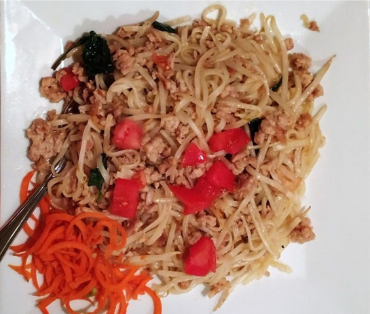 Served with steamed egg noodles, flat noodles or rice noodles. 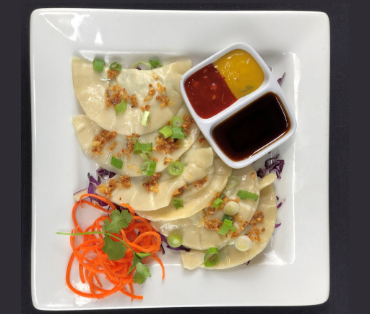 All in a rich chicken stock with garlic, celery, bean sprouts, cilantro & freshly chopped green onions.ewers, gilled with yellow curry & Thai spices with peanut & cucumber red onion sauces. Sautéed mixture of fresh celery, mushrooms, white onion & cashew nuts in a homemade thai chili reduction sauce. Deep-fried fish fillet, topped with fresh vegetables & a light sweet and sour sauce. A spicy red-kaffir lime based curry mixed with coconut cream, bell peppers & carrots. Gentle,‎ yellow curry with coconut cream, diced potatoes, bell peppers, onions & carrots. A medley of fresh vegetables sautéed in a mild oyster garlic sauce. Transparent bean thread noodles sautéed with fresh vegetables & egg topped with ground white pepper. Tempura battered crispy shrimp topped with a sweet coconut cream chili reduction sauce. Stir-fried‎ in a garlic oyster sauce. Thai pan-fried noodles with chicken, shrimp, egg, bean sprouts & green onions in a sweet vinaigrette paprika sauce with ground peanuts & a lime wedge. Stir-fried flat rice noodles in a garlic-paprika sauce with bean sprouts, tomatoes, and green onions. Minced chicken accented with fresh basil, green beans & bell peppers nestled in steamed angel hair pasta. Fried rice mixed with slivered jalapenos, bell peppers, fresh basil, and egg. Steamed tofu with gluten free plum hoisin. Vegetarian. With gluten free plum hoisin. With a bottom layer of crystallized ginger and raspberry preserves. Placed on top of sweet black sticky rice. Malee’s recipe, house made with crushed peanuts. Malee’s recipe, house made and served with coffee beans. Fresh ripe mango slices served with warm sweet sticky rice. 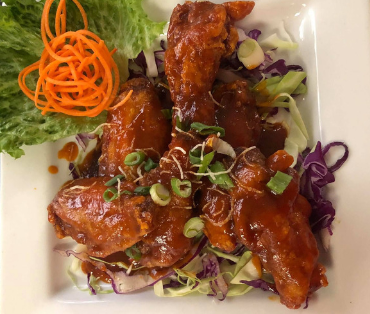 At Malee’s Thai Bistro our chefs have spent the majority of their lives honing a craft that can only be referred to as art, in its truest form. 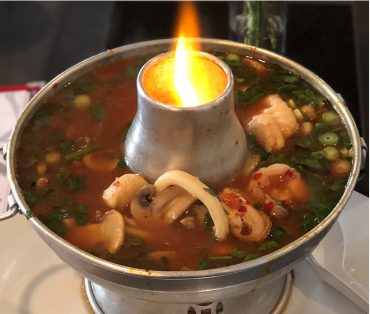 At Malee’s, we always select from the freshest ingredients for the highest level of Thai food restaurant quality as we shape each dish into an expressive work.